With apologies to Mike Trout, playing high school baseball in South Jersey and college ball in New York is not considered to be the fast track to instant success in the major leagues. But Andrew Bailey just did that. If not for a bum shoulder, he might be practicing his speech for Cooperstown at this point in his career instead of serving as instant replay coordinator and a coaching assistant for the Los Angeles Angels. A product of Cherry Hill, Bailey first raised eyeballs while pitching for Paul VI in the league playoffs against Holy Spirit. He decided to accept a scholarship to attend Wagner College on Staten Island, a small school, and showed the fastball that made him an ideal closer. At the end of three years, he was drafted by the Milwaukee Brewers on the 16th round but instead decided to return to college for his fourth year and to earn a degree in business administration. The decision paid off for him. His Wagner number was later retired, which made him only the fourth student-athlete to have his number later retired. And Bailey was drafted again on the sixth round of the 2006 draft. This time he was ready and he made his major league debut on Apr. 6, 2009, throwing a scoreless inning against the Angels. That started a magical year for him. By mid-season, he was established as Oakland’s closer and he was selected to represent the A’s in the 2009 MLB All-Star Game in St. Louis. He broke the Oakland record on Sept. 12 when he recorded his 24th save and finished the season with gaudy numbers of 25 saves and a 1.84 earned run average. 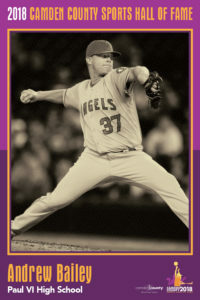 The magic continued in 2010, when he was again named to the All-Star team and registered a 1.47 ERA. But he suffered his first injury the following year when he was hit by a line drive in batting practice. Bailey returned to action but his ERA ballooned to 3.24, although he again finished with 24 saves. He was traded to the Red Sox following the 2011 season and began the season on the DL after reconstructive thumb surgery and claimed the closer job in mid-season. He was then diagnosed with a shoulder injury and missed most of the remainder of the 2012 and all of 2013 when he underwent major surgery. Bailey was released at the close of the 2013 campaign. That was basically the end for him, although he pitched briefly for the Yankees in 2015 and inked a minor league contract with the Phillies in 2016, which perked up promise for both local fans and the ball club. He managed to pitch briefly in the majors with the Angels in 2017, but the shoulder still bothered him and he formally retired last year. He had a career won-loss record of 16-14, 95 saves and an earned-run average of 3.12. Andrew and his wife Amanda now live in Connecticut. In addition to his part-time job with the Angels, Bailey is director of development for the Strike 3 Foundation, a pediatric cancer non-profit charity founded by former teammate Craig Breslow.